To fly cheap or not to fly cheap? First of all, let’s just admit, coming from a hot and humid country like India, we don’t fancy sunny places that much. But having lived in a chilly and somewhat gloomy place like Finland for quite some time we were in dire need of some sun. So after poring over our options we finally chose the Mediterranean this summer and set out to discover the city of ‘so many unfinished monuments’, not on a Kon Tiki style raft of course but a cheap Vueling flight. 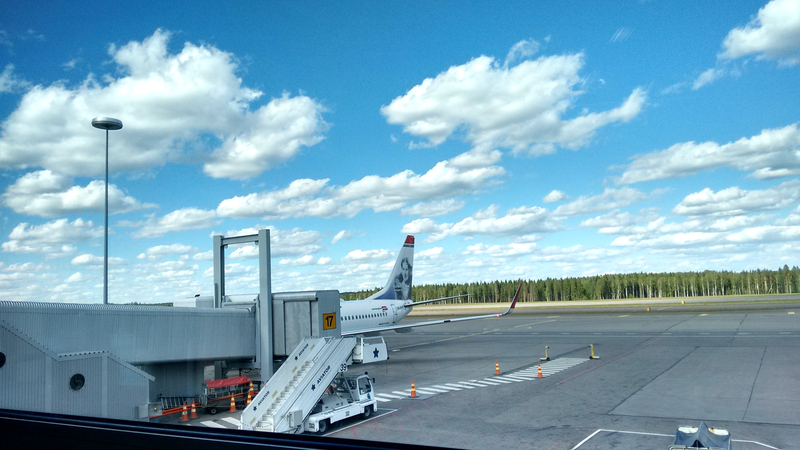 This flight from Helsinki to Barcelona was all about (let’s just say) ‘very rude and dull’ flight attendants. During the noisy flight (too many kids), we called for in-flight snacks thrice and the air hostesses just ignored the calls each time. Even after we pressed the service button nobody came to ask or to turn the switch off. Talk about being left high and dry! It’s not that we fancy cheap airline food, but we had super hungry stomachs to deal with. At last, when my husband went up to the flight attendant she was eating her own meal and finally decided to come to our seats to take the order. To our amazement, she came with the fork she was eating with and gave us a ‘how-dare-you-disturb-me-when-I-am-eating’ look. We wanted to lodge an official complaint with the airline but decided against it as it looked like the flight attendants actually wanted us to complain. Dear Vueling, aren’t you paying these moody women enough? Lesson 1- Never eat at the first restaurant you see. There will be better options. Always. So we landed in Barcelona hungry & excited and decided to focus on the excitement part till we found a Chinese restaurant near La Mar Bella Beach. A bad choice to begin a long-awaited vacation because the food was expensive, tasteless and came with four men constantly staring at us. In India, we are so much used to being stared and even groped at public places that these men looked perfectly normal. So we concentrated on the food. Booze and water for the same price? Almost. 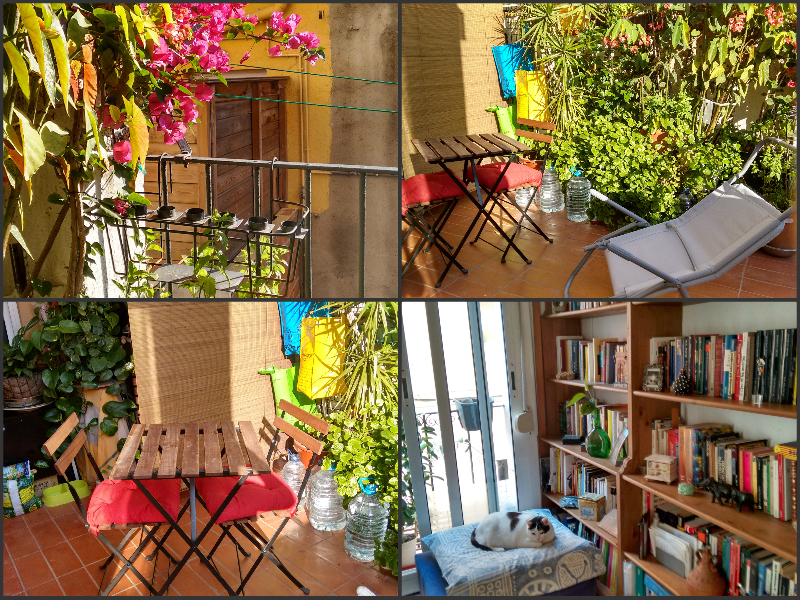 Our Air BnB room was located near the beach at a building which has large Spanish windows and a considerably old façade. But from inside, it was a modern apartment with all the necessary amenities. Our host Cristina was nice and we didn’t have problems interacting even though she didn’t speak much English. It was my first stay in a B&B and was glad that Cristina let us use her kitchen. So we ran to the grocery store and our eyes popped when we saw beer cans at the price of just 50 cents (almost a dream in Finland). And a water bottle for 20 cents! We decided to buy water in case you are wondering. Because, beer doesn’t hydrate you. However, one can get drunk on the very idea of such cheap liquor. On the contrary, drinking in restaurants and pubs in Barcelona is costly. So is the food. Stand in line for sightseeing? Never happened except at the Eiffel tower. 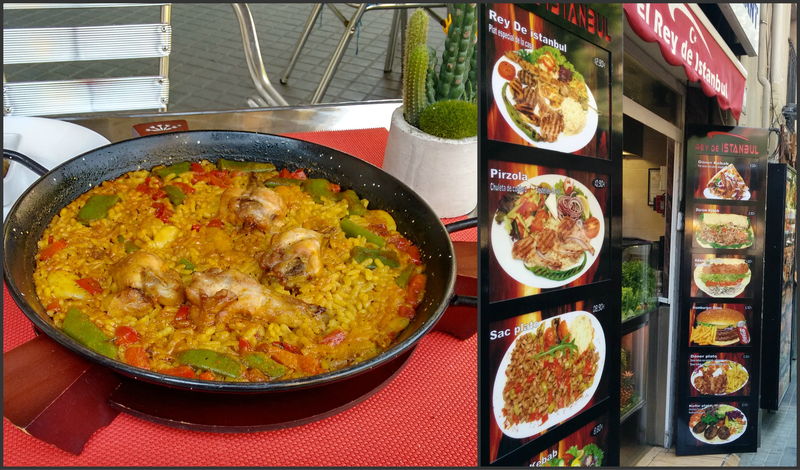 We tried the most popular Spanish dish Paella along with the yummiest Bocadillo Bacon (served as tapas with pickled olives) I have ever tasted in my life. Honestly speaking, the Paella tasted good but it was nothing but ‘Indian khichdi’ that we eat when we are not well. No spices and lots of veggies! It was tasty nevertheless. This happened when we failed to get a ticket to enter the most iconic monument in Barcelona- Sagrada Familia. The queue was too long and the next entry was after 3 hours. From outside it was spectacular and I am sure it looks amazing from inside too. Maybe we would come back when they finish the monument in 2028 or a decade later. Not sure, we would have strong bones to stand in a queue then but one can buy online tickets of course (which we didn’t think of doing this time). 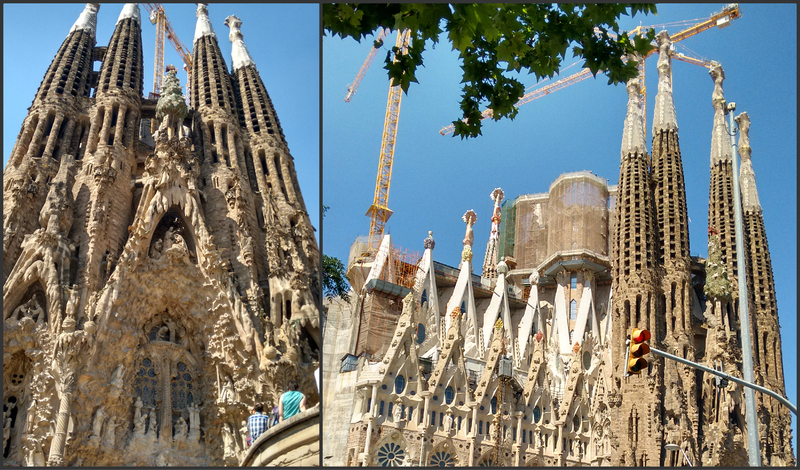 So we decided to skip this place and spent some time at FCB lab which was located just opposite to Sagrada. 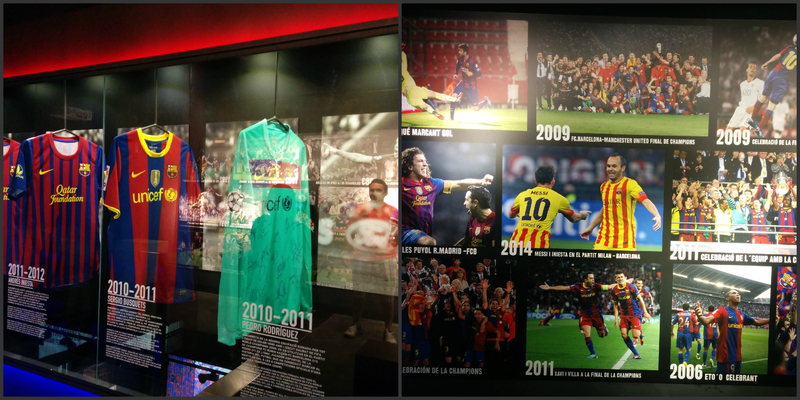 There was a nice museum inside and a store selling all the FCB souvenirs one can imagine. From socks to coffee coasters. And not to mention expensive jerseys. Sunbathing? I hate sunburns but sure. Because we needed to store some sunlight for the winters in Finland. 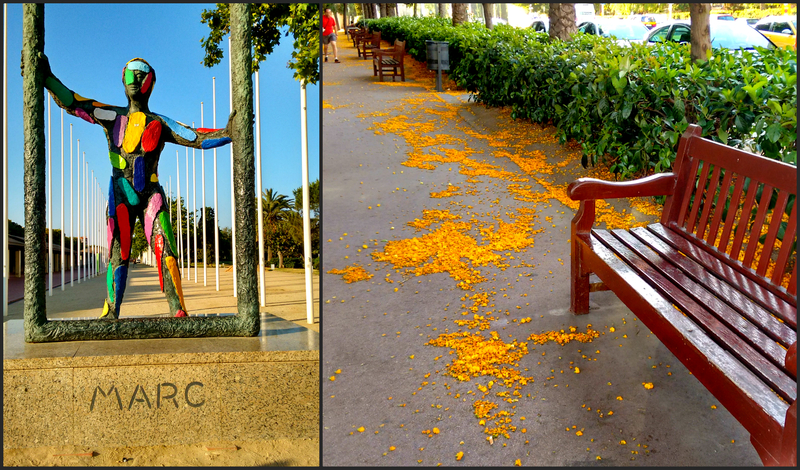 As expected, Barcelona was warm and inviting and we swam to our hearts’ content at a couple of city beaches. I am still carrying the ugly tan but loved the sunny beaches. 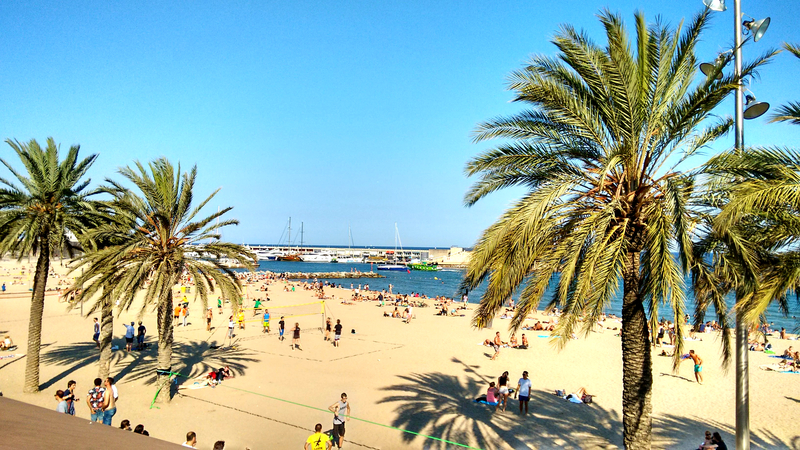 Especially, the Barceloneta beach. But city beaches are not meant for quiet strolls on the beach or serious sun gazing. The moment you get up to get a drink your spot is taken by a new arrival. And not to forget the repeated words of caution you keep hearing in popular tourist spots about minding your bags and wallets. So you are forced to keep your eyes wide open and it kind of spills water on the fun. Port Olympic was the coolest place to hang out in the evening. Perfect for a Segway ride or a private yacht party. I didn’t do any. Because I am scared of speed and insanely frugal. But my husband has an expensive taste of course. So he went for a few of adventure sports options. Sadly, I didn’t let him drive a Ferrari in Paris. The Ferrari was for rent of course and as expected super expensive. Being the frugal b***h I am, I didn’t let him drive it. Now, this is going to haunt me for the rest of my life. I deeply regret it though. Speaking of expensive places, there’s no dearth of options. Rooftop bars are available everywhere. Both expensive and insanely expensive. And from La Rambla to Barri Gotic to Placa Catalunya- you will see three things for sure. Inviting clubs, outrageously good looking Spanish men and expensive cars. Damn! Where did I park my yacht? When in Spain take a road trip for sure. Happy that we had a backup plan for getting up, close and personal with the Mediterranean. For this, we decided to do a road trip to Palafrugell, a municipality in the North-Eastern Spain. In Catalan, they call this gorgeous coastal stretch Costa Brava meaning the wild coast in English. The best part, reaching Palafrugell is only a matter of one and half hour drive from Barcelona. We took two and half hours to reach because my husband didn’t trust my GPS readings or the GPS to begin with. Now, choosing where to go in Costa Brava can be tricky as this piece of paradise is dotted with innumerable beaches and there are so much to explore that no amount of time would suffice. Costa Brava stretches from Blanes, a cute coastal town to the French borders and is often called one of Spain’s best kept secrets. Previously, a coastal area known for its fishing industry, Costa Brava is featured in Spain’s tourism map as one of the bests. We did some research on our own and found out Palafrugell and Begur are two of the most popular destinations within the region. Since, we didn’t want to spend much time in exploring different places we zeroed in on Llafranc, a part of Palafrugell. This is because, we simply wanted to metamorphose ourselves into serious beach bums without worrying about anything, not even serious sunburns. The drive to Llafranc was smooth and our GPS suggested we took AP-7 highway to reach Palafrugell which was about 126 kilometers from Barcelona city center. but I personally would have preferred C-32 which according to my research was more scenic and a much cheaper option in terms of toll roads. This second highway ends in Blanes and one needs to take AP-7 again to reach the destination. In a way, the second option was more time consuming. if you are not in a hurry you could definitely take this route and explore Blanes on the way. I heard this place is most famous for its firework during the last week of July. Moreover, Blanes has a lot of Roman history to tell. Okay. We stopped for selfies. Big deal. Now coming back to Llafranc, it is a hilly town strewn with beautiful white houses and blooming flowers and the velvety sea adds the wow factor to its quaint charm. Seeing the white houses, I was tempted to call it the little sister of Santorini in Greece but, since I haven’t been to Greece yet, I will refrain from calling it so. 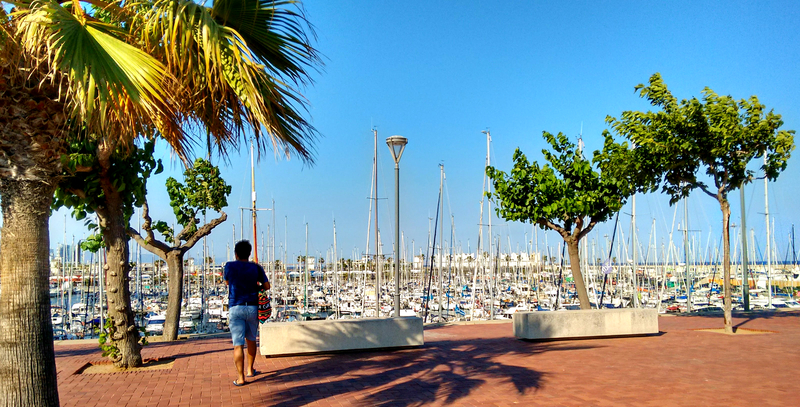 But Llafranc, often called the ‘Laguna Beach’ for its hot quotient (hot men, hot food, and hot fashion) stands apart from any other beach-side towns for so many reasons. First, it is almost surprising to find such a peaceful spot within a close radius of the city life. Just a matter of 100 kilometers, a this looks like a spot far away from the hullaballoo of Barcelona. 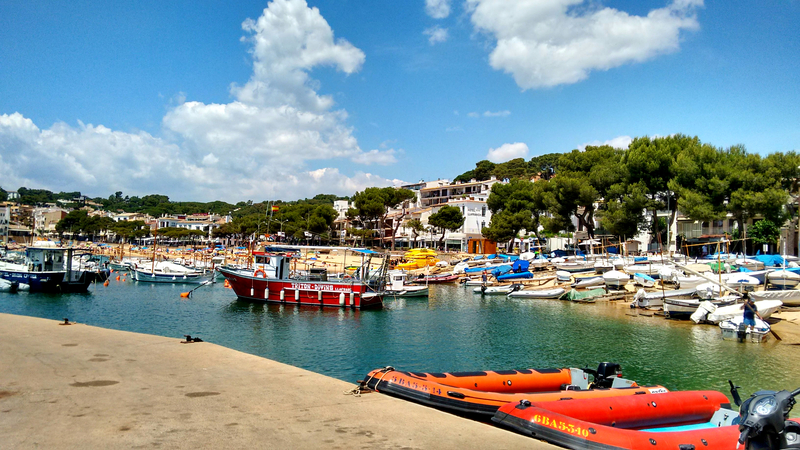 Second, Llafranc offers a combination of hiking trails as well as water sports activities. Just in case, someone in the group disagrees on the definition of fun, they just need to disperse. Boat trips to the hidden caves and coves or invigorating trek routes up to the mountains are its highlights. Third, Llafranc is a shopper’s paradise. Barcelona is always about high-end fashion whereas Llafranc markets sell locally produced items, both fashionable and pocket-friendly. From our point of view, renting a speed boat with a local guide is the best option to explore the nearest beaches. This was not a cheap option like kayaking or boat trip, but definitely worth it. Better if you know sea navigation. rent your own yacht and set out on your own Mediterranean picnic. Any regrets? Yeah, many but mainly two. One visiting Parc Guell, Antonio Gaudi’s famous work. This was located at the end of the city and the road is full of traffic. The sun was harsh and the monumental Zone for which they charge money was nothing but a small area of pretty gingerbread houses. But the rest of the park was pretty plain. Here also one can expect a very long queue. The view of Barcelona city from the top of the hill is amazing though. Unfortunately, when we went up to the hill, the city was blazing under the sun and the flat light kind of makes it look plain. From the top one can spot a few of the famous monuments. I am sure this looks amazing at night but never at day time. Second, visiting the La Monumental. Which used to be Barcelona’s most famous Bullfighting area once. Later they banned bullfights and the area is nothing but an abandoned area. I would have loved to sit there and feel its silence had they not charged 6 euros for the entrance. This was pure cheating. 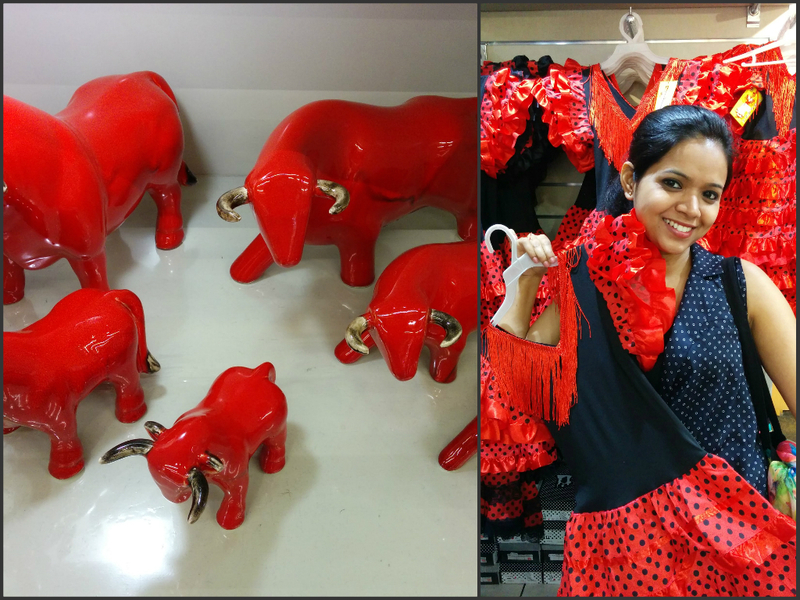 The museum inside was nothing but a small room with few bullfight pictures and costumes. The gentleman at the museum got excited seeing my husband whom he thought to be a Chinese man. This was funny because, he spoke in Spanish and mentioned China and pointed at my husband’s eyes. In gestures, he tried to tell us that he had been to China and likes Chinese people. This was hilarious but, in simple words, visiting the arena was a really bad idea. However, I am so glad that this inhuman practice has finally come to a stop. Crazy bullfighting. No wonder, I won. The rest of my regret list includes- not having enough time to visit FCB stadium, not trying original churros & chocolate, skipping tapas bar hopping, not getting on the cable car to Montjuic Castle and, of course, missing the magic fountain. What saddens me the most is, the light and sound show at the fountain was free and I hate missing free things. Sob. Sob. Sob. I thought Park Güell was a little pricy too, the monumental zone was quite small.